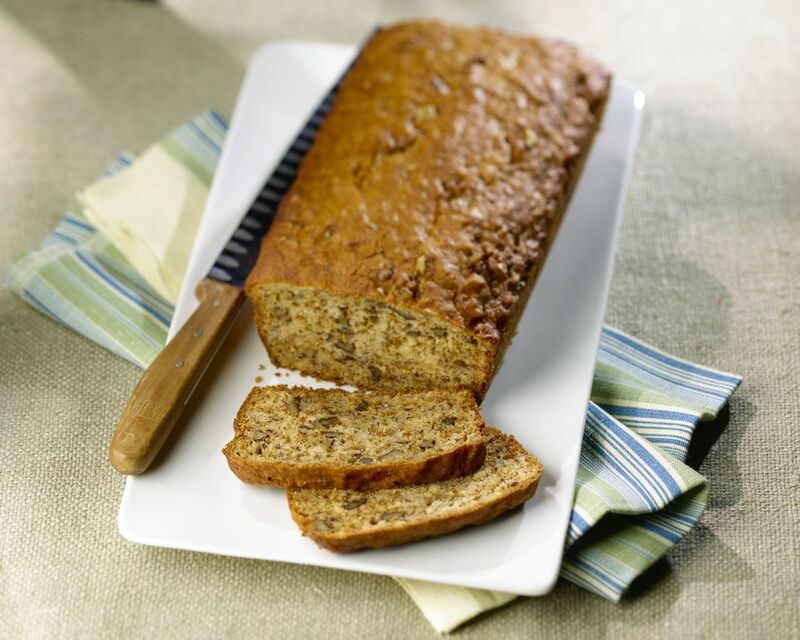 If following your gluten-free diet (GFD) isn't easy because you love "quick breads,” this banana bread is not only moist, delicious and flavorful, but it's also dairy-free and gluten-free, which is great for adults and children with allergies to dairy, wheat or gluten, celiac disease or other conditions. Enjoy a thick slice with your morning coffee, serve it fresh out of the oven with brunch or make a loaf for a friend. And if you want to go a little overboard, serve it with some homemade chocolate hazelnut spread or homemade margarine. We prefer using Arrowhead Mills' All-Purpose Gluten-Free Baking Mix for my baking mix, but feel free to select another dairy-free gluten-free baking mix or make your own! As with any recipe intended for people with allergies, make sure to read the ingredients of all of your recipe ingredients to make sure that there are no dairy, wheat, or gluten additives. Lightly grease a 9" x 5" loaf pan with dairy-free, gluten-free soy margarine or oil and set aside. In a medium-sized mixing bowl, sift together the gluten-free baking mix, white sugar, baking powder, baking soda, ground cinnamon, and salt. In a small mixing bowl, combine the mashed bananas, unsweetened applesauce, canola oil, pure maple syrup, and lightly beaten eggs. Add the wet ingredients to the dry ingredients, mixing until well combined. Pour the batter into the prepared loaf pan an bake for 45 minutes, or until a toothpick inserted into the center emerges mostly clean. Transfer the loaf to a wire cooling rack and allow loaf to cool for at least 20 minutes before removing (if you're intending to make your bread now and serve it later, allow the loaf to cool completely in the pan before removing). Then wrap the loaf in plastic food wrap and store at room temperature. This recipe is really versatile, so feel free to add other fun ingredients like walnuts, pine nuts, dark dairy-free gluten-free chocolate pieces and dried fruits like raisins, dates, dried cranberries and dried cherries. You can also substitute part or all of the applesauce for more bananas or even substitute 2-3 tablespoons of the applesauce for peanut butter.